Hi everyone! Apologies for the lack of posts lately but something very exciting happened...my boyfriend of 8 and a half years and I got engaged last week! I also started my brand new job! Needless to say a lot has been going on, but I promise I will not drop the ball and I will get some great posts cooking this week/weekend. Until then, here is your Tip of the Day! If you have sparse brows, or just like to fill in the gaps, picking the correct fill color can be super difficult. Your tip today is to always choose COOL colors for your brows. Eyebrows have very grey undertones, and therefore warm eyeshadows look extremely fake when used on the brows. Anything in the taupe family (darker or lighter depending on your eyebrow color) seems to go well with brows. 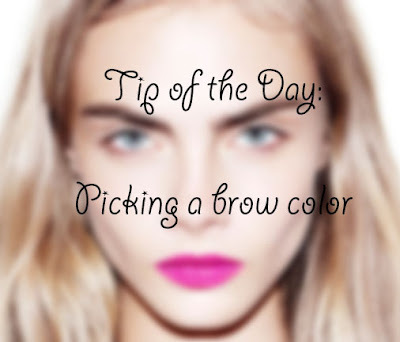 Also, go a shade lighter than your brow color unless you are purposely trying to darken and emphasize them. If you are going for the natural look, a slightly lighter color will help to define your brows without making them more prominent and pronounced. These subtleties can be so obvious in natural light and can really throw off your look. When looking for a brow product, I recommend sticking to the best...Anastasia Beverley Hills is obviously the "go to," but most high end brands should sell nice brow products. I have a pencil by Tarte that I like and I have also heard good things about Benefit's eyebrow products. Don't get me wrong though, there are definitely great drug store gems, they just may take a bit more trial and error to find! Oh my gosh congratulations! thats such exciting news! Youll have to keep us all updated on your wedding planning! I love that you used cara as your picture, her brows are fantastic. I unfortunately have sparse brows that I fill in everyday (the chlorine doesn't help them grow either haha). Some great tips! Congratulations on the engagement and on the new job! Life sure is exciting for you right now, lol. Thank you for sharing these tips. Im new at filling in my brows, and this is definitely helpful. Nicki Minaj Inspired Club/Futuristic Makeup! Fall Haul!-MAC, Urban Decay, OPI and more!